Marsh Vulnerability Vegetated areas convert to open water near Robbins Landing in Maryland's Blackwater National Wildlife Refuge. © M. KIrwan/VIMS. Field Studies Researchers measure the movement of sediment into and out of the marsh at Blackwater National Wildlife Refuge in Maryland. These methods are labor intensive and time consuming. © N. Ganju/USGS. Field Studies Study co-author Zafer Defne operates an acoustic Doppler current profiler to measure water and sediment fluxes at Forsythe National Wildlife Refuge, New Jersey. These methods are labor intensive and time consuming. © S. Brosnahan/USGS. Scientists working on a rapid-assessment technique for determining which US coastal salt marshes are most imperiled by erosion were surprised to find that all 8 of the Atlantic and Pacific Coast marshes where they field-tested their method are losing ground, and half of them will be gone in 350 years’ time if they don’t recapture some lost terrain. The research team—led by the US Geological Survey and including Virginia Institute of Marine Science professor Matt Kirwan—developed a simple method that land managers can use to assess a coastal saltmarsh’s potential to survive environmental challenges. 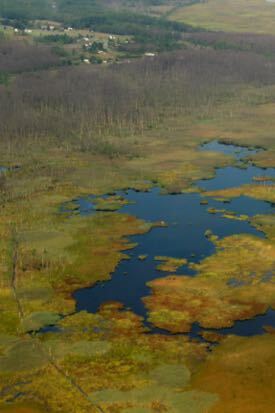 The method, already in use at 2 national wildlife refuges, uses any one of several remote-sensing techniques, such as aerial photography, to gauge how much of an individual marsh is open water and how much of it is covered by marsh plants. By comparing the ratio of ponds, channels, and tidal flats to marsh vegetation, land managers can determine which marshes stand the best chance of persisting in the face of changing conditions. This ratio, called the Unvegetated-Vegetated Marsh Ratio or UVVR, is a good surrogate for much more labor-intensive field studies, says oceanographer Neil Ganju of the USGS Woods Hole Coastal and Marine Science Center. Ganju is the lead author of the study, which was published January 23 in Nature Communications. In addition to Ganju and Kirwan, the other authors are Ganju’s colleague Zafer Defne, Sergio Fagherazzi of Boston University, and Andrea D’Alpaos and Luca Carniello of the University of Padua. “Our method does a good job of tracking the main destructive processes in marshes—the conversion of vegetated areas to open water, and the loss of sediment,” Ganju says. “Together these changes control the long-term fate of the marsh." Saltmarshes worldwide are being lost to sea-level rise, erosion, and land-use changes. These marshes protect the coast against storms and erosion, filter pollution, and provide habitat for fish and shellfish. Land managers nationwide want to know which marshes stand the best chance of enduring, so they can concentrate marsh conservation and restoration work where it will be most effective. But making that assessment is normally difficult and costly, the researchers said. To find out whether the UVVR is a good predictor of coastal salt marshes’ fates, the researchers applied it to 8 marshes that had already been studied. The sites were portions of Seal Beach National Wildlife Refuge and Point Mugu Naval Air Station in California; Rachel Carson National Wildlife Refuge in Maine; Fishing Bay Wildlife Management Area and Blackwater National Wildlife Refuge in Maryland; Reedy Creek and Dinner Creek at New Jersey’s Edwin B. Forsythe National Wildlife Refuge, and Schooner Creek in New Jersey. The researchers wanted to include marshes that seemed fairly stable and ones that seemed unstable. And to test their method, they needed sites where scientists had already done the field studies necessary to develop a detailed local “sediment budget." "Think of a marsh as similar to a savings account, with sediment as the principal,” Ganju says. “Every new deposit of sediment is like interest added to the principal, and every sediment loss is like money spent. If a marsh is gaining sediment, it can tolerate some withdrawals, and the budget will still be in the black. If it’s losing sediment, that marsh is in the red. Its sediment either gets replenished by natural processes or human intervention, or eventually the principal will all be spent." All 8 marshes’ sediment budgets were “in the red.” And in each case that UVVR result correlated with the sediment budget, confirming that each of those marshes is losing ground. The researchers calculated the likely life spans of all 8 marshes. The shortest, at Maryland’s Blackwater National Wildlife Refuge, was approximately 83 years. The New Jersey marshes had life spans ranging from 170 to 350 years. The researchers stressed that these figures are estimates with large margins of error, and don’t necessarily mean that these marshes are doomed—only that they will need infusions of sediment to last longer. Staffers at Massachusetts’ Parker River National Wildlife Refuge are working with members of the research team to identify which marsh units are losing sediment, and at what rates. "This will help us figure out where we can make a difference with restoration techniques. It will also help us determine which areas are beyond restoration," says Refuge Manager Bill Peterson. "This ensures that we're using our limited resources effectively to strengthen and enhance these valuable natural areas."